“We must show the dog who’s boss”. Guarding food and resources can be a contentious issue where human response is concerned. Many conscientious dog owners, doing what they believe is best, follow dangerous, outdated notions. These techniques can involve, right from the start as routine training, interfering with a puppy’s food while he’s eating and forcing objects out of his mouth. An easy-going puppy may simply tolerate it. Another may not. Instead of making the puppy back away from something he values, it can teach him to run off with the item and then, cornered, defend both the item and himself. I’ve seen this many times. How might we ourselves react if someone tried to take bits of food off our plate or mugged us for something we had picked up? There is that infamous clip of Cesar Millan ‘dominating’ a Labrador guarding food and his bowl. Guess what happened? Yes, the poor dog ultimately had no choice other than to bite after all his warning signals had been ignored. As a result of the uproar about this, he was interviewed by Alan Titchmarsh which is interesting to watch. Somehow this ‘being the Alpha’ with our dog thing had became popular culture, but it’s been totally debunked over recent years. Not only was it based on false assumptions regarding wolf packs (and domestic dogs aren’t wild wolves), but that using force is the only way to create an obedient dog. Even this word ‘obedience’ suggests dominance and forced compliance. Just one problem with this approach to resource guarding is that a strong-minded and confident dog is likely to stand up for himself – eventually. Some dogs genetically are more wired to guard. If a ‘dominated’ dog backs off due to being overpowered by a particular human, what happens when someone else tries it? “Why should I want your food anyway”? How much better and simpler in every way it is to teach the dog that you’re no threat to his food; if nobody wants his food, what’s the point of guarding food after all? 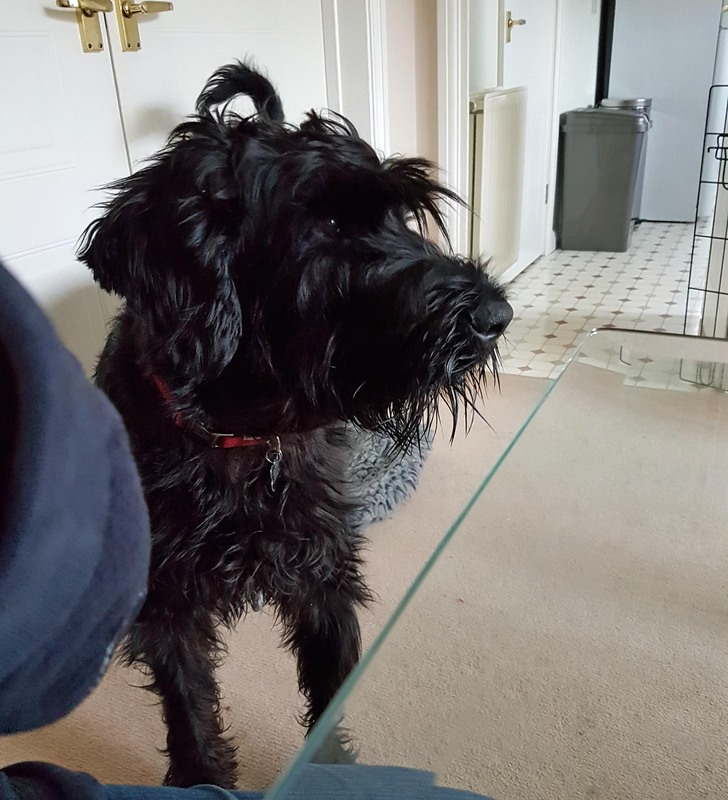 Giant Schnauzer Rex is a very intelligent and energetic adolescent dog. He’s on the go most of the time when people are about, back and forth looking for trouble. This includes nicking anything he can that may be of value to his humans. It triggers a chain of reactions. He’s probably under-stimulated where appropriate enrichment is concerned, so he orchestrates his own action. It’s only natural for us to try to control over-excited and aroused behaviour by trying to stop it. Unfortunately scolding and warnings, Uh-Uh and NO, introduce conflict and confrontation. Even conflict can be rewarding and reinforcing in a way (else why do humans enjoy certain sports so much?). Rex’ owners will now be on the lookout for every little good or desired behaviour to reinforce instead. It’s proven beyond doubt that removing reinforcement from unwanted behaviours and adding reinforcement to behaviours we DO want leads to success. Interfering with Rex’ food while he’s eating. Using the ‘interfering with his food’ technique seemed to work when Rex was a young puppy. Unfortunately, guarding and growling re-appeared big time when he started to be fed something that was, to him, of much higher value. Instead of leaving him to eat in peace, various suggestions had been given including hand-feeding him, touching him while he was eating and taking his bowl away. Instead of feeding him somewhere out of the way, the bowl is deliberately put where people regularly have to pass by him. He freezes. He growls. They reprimand him. This can only go in one direction. He simply needs to know that nobody is interested in his food anymore. He will be fed somewhere out of the way. After some weeks of this they may from time to time walk past him at a distance, not looking at him, and just chuck in the direction of his bowl something particularly tasty – maybe a leftover from their own meat dinner. The food must be something of higher value to him than his own food. They shouldn’t hover or speak to him. ‘I happen to be passing anyway so here’s something nice’. Over time they can get a little closer. If he growls, they have got too close or maybe stood still, and will need to leave it for a few days and do it from further away the next time. Any approaching person will deliver something better than what he has. This really is in case of emergency should later someone, without thinking, get too close to him. They should only do this from time to time – a random and casual thing. Back in the day people would have said, ‘Leave the dog alone while he’s eating’. We expect a lot from our dogs today. We may need to do some serious, systematic work on general resource guarding. ‘Operation Calm’ is the first priority. Rex’ high arousal levels and restlessness make work on his guarding food and other items more difficult. This is a huge challenge because it’s hard for us humans, like old dogs, to learn new tricks. It also means that Rex will initially become very frustrated when his usual attention-seeking tactics no longer work. He will try harder. They will hold their nerve and add as much appropriate enrichment to his life as possible, activities that don’t depend upon their ‘fielding’ the behaviour he throws at them but instead are initiated by themselves. I suggest very regular short bursts of activity including mental enrichment, hunting, foraging and sniffing, particularly in the evenings when they sit down and he’s the most trouble. He then won’t need to be pestering for attention. If he feels it’s not under threat, Rex won’t need to be guarding food. If he has plenty of attention offered, he won’t need so desperately to indulge in the attention-seeking ploys that he knows get the most reaction. Getting Rex calmer involves most aspects of his life and will be a gradual thing. NB. For the sake of the story and for confidentiality also, this isn’t a complete ‘report’ with every detail, but I choose an angle. The precise protocols to best use for your own dog may be different to the approach I have worked out for Rex because neither dog nor situation will ever be exactly the same. If you listen to ‘other people’ or find instructions on the internet or TV that are not tailored to your own dog, you can do much more harm than good as the case needs to be assessed correctly. One size does not fit all so accurate assessment is important, particularly where any aggression is concerned. 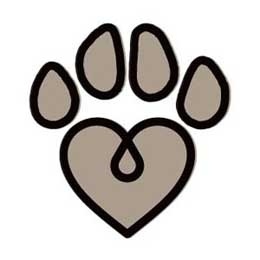 If you live in my own area I would be very pleased to help with strategies specific to your own dog (see my Help page).